Palm beach in Vai belongs to the TOP 10 most popular tourist destinations in Crete. It is known primarily from the palm forest, which grows here. It is the largest palm grove in Europe, covering about 250 thousand square meters, which currently grows less than 5000 trees. However, not only palm trees attract tourists to this place, because the picturesque Vai is also a great sand and pebble beach, partially hidden in the shade of palm leaves. A warm and dry climate, an exotic beach with whitish sand and palm trees bring to mind landscapes from Africa and the Caribbean. Vai grew loud when in the 1970s a commercial of coconut Bounty bars was filmed on the background of a palm grove, which probably most of you associate. Coconuts falling in advertising were fabricated because only date palms grow on Vai. Nevertheless, paradise on earth was discovered. The hippies first appeared here, looking for a new mecca, and Vai became a giant camping site surrounded by a mountain of garbage. Reading various guides you probably came across various theories about the emergence of a palm forest. The most popular of them says that the palm trees grew out of date seeds, which were chewed by the Saracen pirates who came here. Pips that spit out on the ground turned into about 6,000 trees. In another theory, the place of the Arabs was occupied by Phoenician sailors who colonized this part of Crete. These legends, however, can be inserted between fairy tales, because scientists have dealt with them, who proved that the species of palm growing here is an endemic plant known as Phoenix theophrasti (Cretan Date Palm). This palm tree has been known since ancient times and its existence has been recorded in historical accounts. Although the beach is considered to be sandy, it is actually sand and pebble. The gravel turns into dust in places, which, when heated, reaches temperatures that prevent comfortable walking. For this reason, wooden platforms have been placed here. The beach is equipped with a complete tourist infrastructure. For 6 € you can rent sun loungers here with a characteristic umbrella, if there are free seats. Due to its fame, this beach in high season is heavily besieged, so after arriving there is a high probability that the seats are only in the shade of palm trees (though not necessarily) or just on the sand. Other facilities include fresh water showers and toilets. There is a tavern by the beach, supposedly placed illegally, unfortunately offering prices at slightly inflated prices. The beach, like the palm forest, is fenced and the car should be left in a paid parking lot located 200 m in front of the beach. On the Vai you can also do typical sports water sports (wakeboarding, scooters, water skiing), calm waters also encourage enthusiasts of watching sea life for swimming with a snorkel. It is also worth spending some time to enter the viewpoint, from where you have a beautiful view of the beach and the forest. This beach is available for motorized tourists, because travel agencies rarely offer their customers a trip to remote Vai. You can also get here by KTEL, because there is a connection organized from Sitia, but you have to plan it well. First, ngo to Sitia, 24 km away, and catch a bus to Vai 2-3 times a day. Vai is located 94 km from Agios Nikolaos and 24 km from the larger city of Sitia. Due to the very distant location from popular tourist centers, an excursion to Vai is worth combining, for example, with visiting the monastery of Moni Toplou, to which the whole area belongs. It is also worth taking the opportunity to look into Itanos, where there are very interesting excavations. 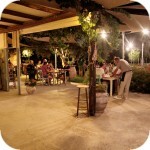 If your hotel is in the middle of Crete, getting to Vai will be an expedition to which you have to spend the whole day. Getting from the western part of Crete is basically unprofitable. Convenient New National Road past Lastros goes into a much narrower road full of curves to the limit. It passes into a more simple form only after the village of Skopi, not far 9 km before Sitia. For this reason, getting here takes a lot of time and is quite tiring. Next to Sitia, the landscape is compared to some of the North African ones. Overcoming the remaining road between Moni Toplou and Vai is not a problem. It is a fairly simple route, just follow the signs. Damnoni boasts a wide beach located in a deeply embedded bay, the boundaries of which are marked by two peninsulas facing the sea. Along the shore of a small river that flows into the sea in the western part of the beach, there is a local road where you can leave your car. However, if you plan to come here weekend, you have to reckon with the fact that finding a free place to park the car can take a moment. Diaskari Beach, also known as Green Beach, is less than 3 km from Makry Gialos. This quiet place with a small and simple tavern is a good way to spend a relaxing day away from more crowded places.